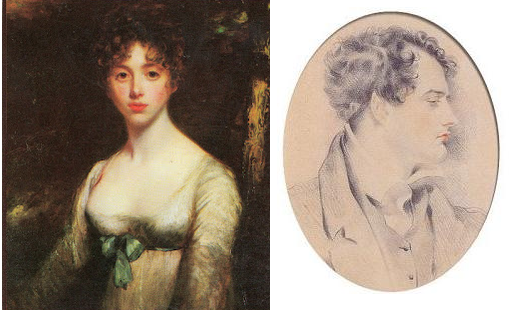 On November 9, 1812, Lord Byron writes again to Lady Melbourne about the perennial problem that is Lady Caroline Lamb, who has written "another Irish epistle, foolish, headstrong, & vainly threatening herself." Byron ends the letter by writing that he has now found someone who will give him a quiet love that is the very opposite of the "ridiculous display of last season" with Caroline. Lady Melbourne knows he is referring to Lady Oxford. He writes "I cannot exist without some object of love – I have found one with whom I am perfectly satisfied, & who as far as I can judge is no less so with me; our mutual wish is quiet – & for this reason I find a double pleasure (after all the ridiculous display of last season) in repose; I have engaged myself too far to recede, nor do I regret it – are you at least satisfied with what I have done to comply with your wishes if Ly. B. is not? If Ly. C. wishes any interview pray explain for me that I will not meet her, if she has either pride or feeling this will be sufficient – all letters &c. &c. may be easily destroyed without it". I cannot exist without some object of love – I have found one with whom I am perfectly satisfied, & who as far as I can judge is no less so with me; our mutual wish is quiet – & for this reason I find a double pleasure (after all the ridiculous display of last season) in repose; I have engaged myself too far to recede, nor do I regret it – are you at least satisfied with what I have done to comply with your wishes if Ly. B. is not? If Ly. C. wishes any interview pray explain for me that I will not meet her, if she has either pride or feeling this will be sufficient – all letters &c. &c. may be easily destroyed without it. Thanks so much for doing this. The mix of news from America, Russian and London is almost too much. What will you be doing in 2013? Thanks for the comment. I agree it is too much. However, the range of areas does allow me to post something for everyday of the year. In 2013, I think that I will be concentrating on the twitter feed. The blog posts are taking too long to prepare since I have been writing at least one post on each day over the last year. I know the feeling! I seem to agonize over my posts! Looking at my earlier comment, I think that an exclamation mark would have helped. I love my Tolstoy, my Thackeray and my north American politics; all of it in one go is almost too much! Again, thank you so much!